Since the lithograph itself is an advertisement for an antique alcohol, both the taste and smell would be bitter. 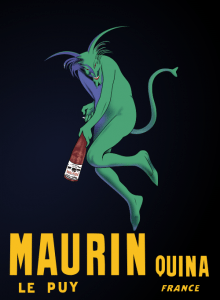 A bottle, held by a green devil, generally becomes the focus of the poster and the audience would be about to imagine tasting and smelling a bitter alcohol as they look into the artwork. The color tone of the poster is generally dark and dull, but the tone of yellow letters, located below, are printed bright compared to other colors. The color scheme of the poster turns a silent, but also horrific music, following with a surprising sound that stimulates the audience. Since the audience’s view towards the devil is negative, the green devil is expressed as a horrific music, covering the silence of the black background. The yellow title then turns on the surprising sound (example. trumpets or trombones played together in minimum two chords). At last, the pose of the green devil is influenced by Japonisme, since the figure itself is curved and viewed from the angle mostly seen from Eastern arts’ human figures. The green devil looks like it’s tip toeing silently, reminding a thief stealing something. Perhaps the green devil represents a choreography of walking suspiciously, following with the silent and horrific music. When I look at the poster of “Books”Soviet propaganda graphic design, 1924, poster by Aleksandr Rodchenko I remembered two artist’s work were inspired by him, they are Matthew Cooper and Shepard Fairey. 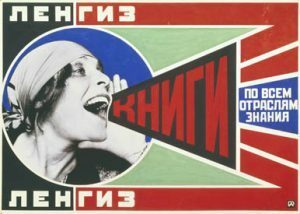 “Books”Soviet propaganda graphic design, 1924, poster by Aleksandr Rodchenko has been inspiring a lot of contemporary graphic designers. 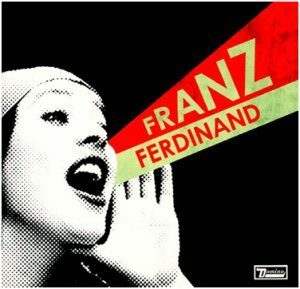 Franz Ferdinand (Rock band) based their album cover “You Could Have It So Much Better” on Rodchenko’s Lilya Brik poster. The designer Matthew Cooper used the same basic style of Rodchenko’s work. The women is in the same position and also he uses the same colour scheme in his design. As we can see there is a similar style and setting between each of them. 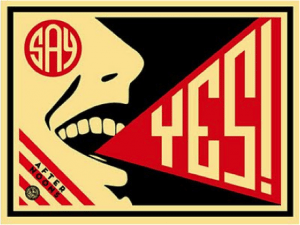 When we are looking at Shepard Fairey’s design we can see there is a same element of style which is also inspired by Rodchenko’s poster “book”, his design is in a Russian constructivist style and the text is all in big block letters, it is clear and legible. “Synesthesia is a neurological condition in which the stimulation of a sense like touch or hearing leads involuntarily to the triggering of another sense like sight or taste” (Tate). 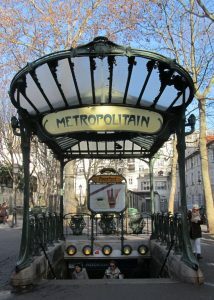 Art Nouveau is a revolutionary movement that has emerged during the 19th century. This movement seeks to escape historical styles and aimed at modernizing designs. It is committed to abolishing the traditional hierarchy of arts, such as paintings and sculptures. 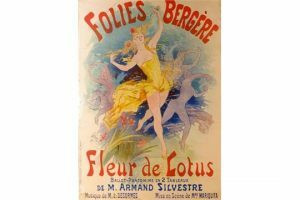 During this period, many artists, such as Henri de Toulouse-Lautrec were drawn to natural, organic and geometric forms and emphasizes line contours over colours. 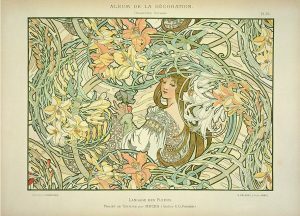 (“Art Nouveau Movement, Artists and Major Works” ). 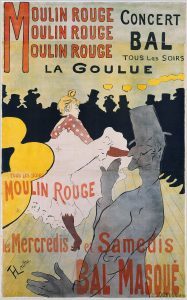 This characteristic was seen on his very first poster, Moulin Rouge: La Goulue. The crop composition of the poster gives the feeling that the viewer is part of this joyous event, caught up in the excitement and buzz of the place. Through the use of large-scaled, simplified forms with thick contours it evokes the feeling of thrill as if the viewer is pretty close to the stage and able to interact with the performer. With the emphasis of lines and limited hues elicit softness touch on the piece, especially the white skirt that the dancer is wearing. It gives the impression that it would feel soft and velvety when it is touch. 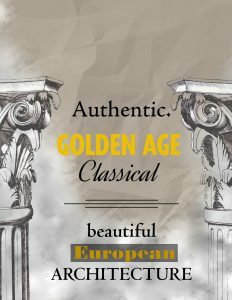 In imagination, the use of muted colours such as green, yellow, and orange, the composition would taste bland or boring and bitter, as it is only limited to these colours. Through not having any other colours, it does not create a spark, creating an overwhelming taste, thus having an uninteresting taste. Translating this piece to sound, it would be upbeat, happy and bright music. Also, there would be a crowd loudly cheering on the background and a walking sound in the foreground, as this piece has something going on on each of its grounds—have closure. On the piece, silhouette of people watching (background) the dancer (middle ground) is seen, while a man near edge of the frame (foreground) is seen walking to the left. “Art Nouveau Movement, Artists and Major Works.” The Art Story, www.theartstory.org/movement-art-nouveau.htm. “Moulin Rouge: La Goulue | Henri de Toulouse-Lautrec | 32.88.12 | Work of Art | Heilbrunn Timeline of Art History | The Metropolitan Museum of Art.” The Met’s Heilbrunn Timeline of Art History, www.metmuseum.org/toah/works-of-art/32.88.12/. Tate. “Synaesthesia – Art Term.” Tate, www.tate.org.uk/art/art-terms/s/synaesthesia. 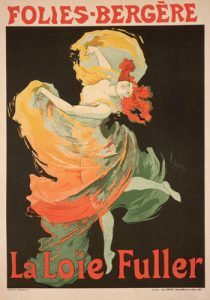 Jane Avril poster was created by Latrec at Henri de Toulouse in 1893. 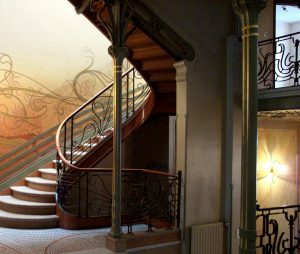 Artist used art nouveau style to record a crazy and secret night life of Paris at that time. Avril showed her signature “cancan” action and there is an unseen musician who hold a cello’s handle with shadow. 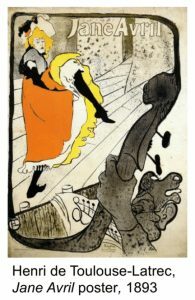 Art nouveau was influenced by Japanese style, it focused on skewed perspective, severe cropping, flattened forms, and sinuous lines, such as curved lines on Avril’s dress. Artist used orange, yellow, black and green in this poster. There are some textures on the background and the whole effects show vintage style. It reminds me of the vintage jazz music. The colour orange and yellow were contrast with background in this poster. They were attracted my eyes and let me hear a brisk and jumping jazz music. This poster let me hear there are lots of people were dancing in the night club with brisk and jumping vintage jazz music. Curve lines remind me of a jumping movement and rhythm for them. pia). It is a constructivism art work. 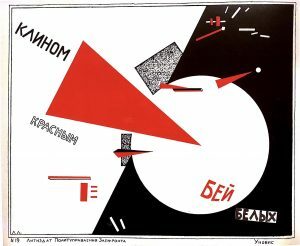 El Lissitzky divided the whole composition into half-white and half black. A huge red triangle was placed in the centre that pierces into a white circle, which creates the focal point. Beat the Whites with the Red Wedge is a two-coloured lithograph. Although the colour palette that used was simple, I can feel the motion and movement through those simple geometric shapes. A lot of design principles is happened there such as contrast and focal point to catch the audiences’s eyes. The whole composition is dynamic appealing and full of tension. The artist demonstrated the condition of the war by using metaphors. We can definitely feel the tension of the war through those geometric abstract shapes. “El Lissitzky makes a simple, direct emotional appear to the viewer” (Eskilson 194). As a synesthete myself, when looking at this piece of art work, I could hear a loud crack sound. Those red triangular shapes reminds me of the broken pieces of glass. The edges of the shapes make me feel sharp pain on my skin. The red colour reminds me of the smell and the taste of the blood. The black part smells like weapons made by steel which tastes cold and sweet while the white part smells like the cold air floating on the early morning battlefield before the sunrise. Eskilson, Stephen John. Graphic design: a new history. second ed., Laurence King Publishing, 2012. “Beat the Whites with the Red Wedge.” Utopia/Dystopia, 1 Jan. 2013, utopiadystopiawwi.wordpress.com/constructivism/el-lissitzky/beat-the-whites-with-the- red-wedge/. Philip Astley is widely credited as opening the world’s first circus in 1782 in England. Building on his experience of equine stunts beginning around 1770, he incorporated more theatrical acts with accompanying music and designed his stages to fit the shows rather than the other way around. 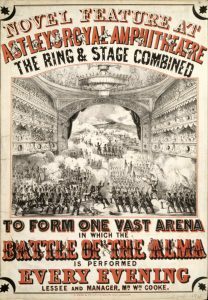 It wasn’t until 1795, however, that the Astley Ampitheatre officially opened after the initial structures burnt down during fire hazards. These events are rooted in the Neoclassical era (1760-1800), though the typeface most associated with circuses became prevalent during the mid-19th century. 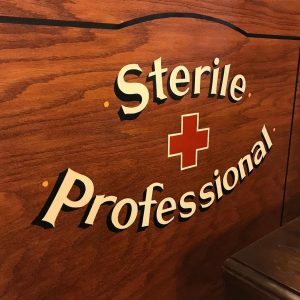 As seen in the image above, the postcard depicts a mixture of sans serif and slab serif fonts but all are strong, bold, and meant to draw immediate attention. 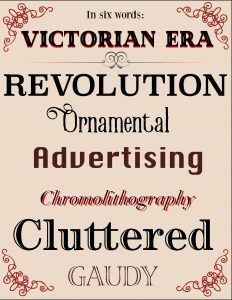 This genre of typeface is intentional in it’s clean design: it could be read from far away or up close, as a poster or a handbill. 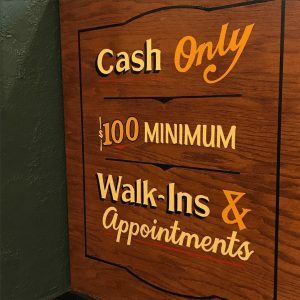 The typography that was born in this era has a direct influence on signage for tattoo shops today, specifically those that practice “traditional” style of tattooing. Traditional tattooing refers to the earliest forms of tattooing in North America and Europe. 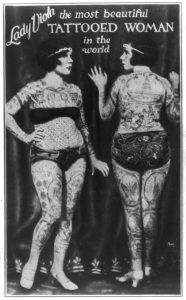 During the mid- to late 19th century, tattoos were introduced and gained notoriety in the “Freak Show” or side show segment of a circus. Both men and women who had full body sleeves of tattoos would travel as part of the circus and spectators would pay to oogle at them. The hand-painted signage used at the circuses had the same qualities as used on posters: it had to stand out. 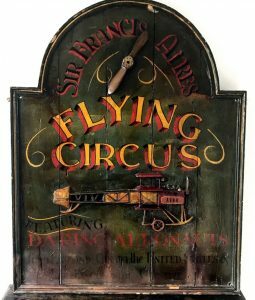 Vintage circus signage ca. 1920. Tattoo shops that implement this type of design into their logo, branding, or interior decoration pay homage to North America’s earliest roots to tattoo culture: the circus. 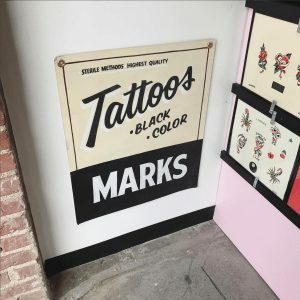 The shops celebrate not only the craft of hand-painted signage, but the essence of the alternative, spectator sport that gave tattooing it’s platform and allowed it to break into the mainstream of society. Below are three contemporary examples by artist Ty Hjortland who is based in Los Angeles, California. 2. “Lady Viola” – credit unknown, via pinterest. Eskilson, Stephen John. Graphic design: a new history. 2nd ed., Yale University Press, 2012. 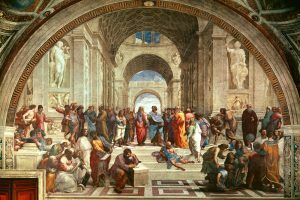 “The School of Athens [Raphael].” Sartle – See Art Differently, 30 Nov. 2017, www.sartle.com/artwork/the-school-of-athens-raphael. Baines, Wesley. 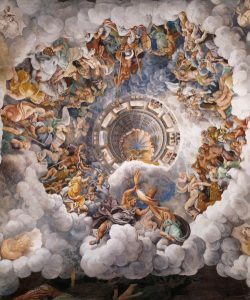 “7 Ancient Pagan Gods We Still Love Today.” Pagan Gods | Movie Gods – Beliefnet, Beliefnet, Inc. and/or its licensors, www.beliefnet.com/entertainment/7-ancient-pagan-gods-we-still-love-today.aspx.